Description: A port of an old console based yatzy game I made a couple of years back. 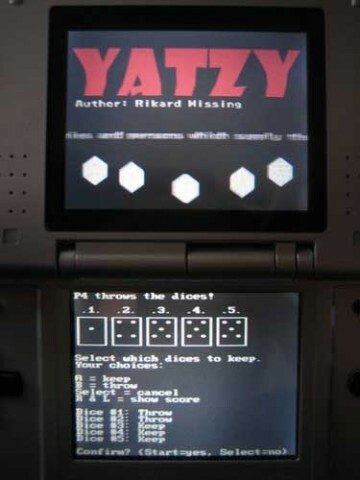 Dont know what yatzy is? Well.. its a dice game. =) Try it out! Dont know the rules? Read them ingame. Supports up to four players! Supports both english and swedish! This is my first NDS project so expect to see more from me as I keep on learning. Yeah right.. YatzyDOS doesn't currently work on any emus. YatzyDOS Neo Flash Compo 2005 Edition NEWEST!